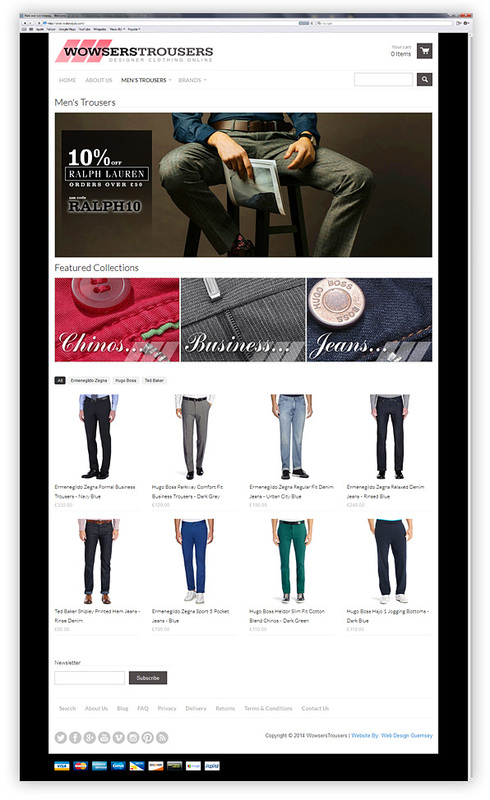 Wowsers Trousers is demonstration e-commerce website for a shop selling men’s designer clothing online. 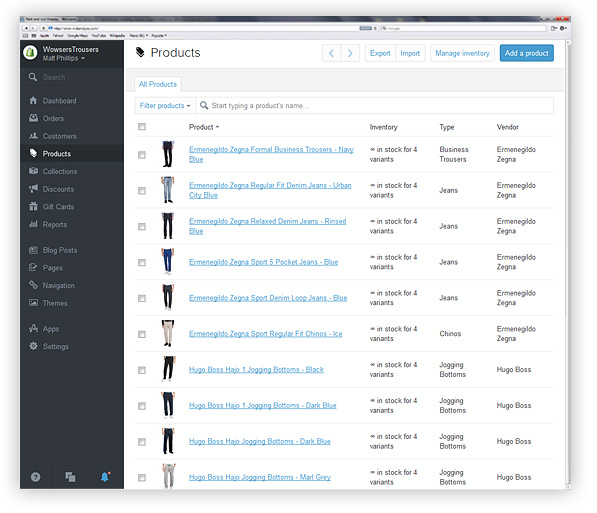 It displays the various features and functions available to a modern online shop. Features include product, category and brand management, a voucher code system, order management, customer information, page and blog management as well as many other features. 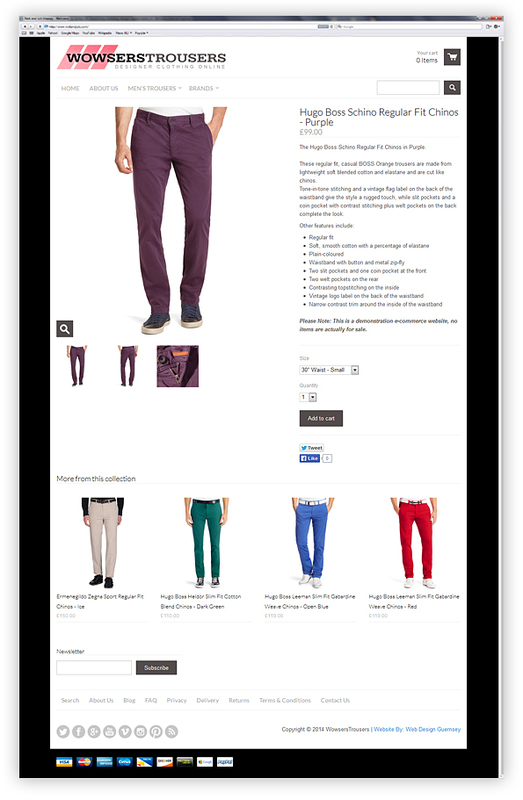 Click here to view the Wowsers Trousers E-Commerce Website. 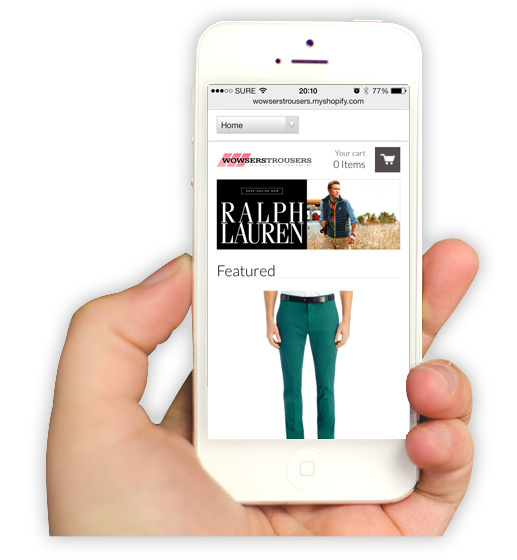 The Wowsers Trousers website employs a responsive web design which means that it automatically resizes to look great whether a visitor is viewing the website on a desktop PC, a laptop, a tablet or a mobile phone. 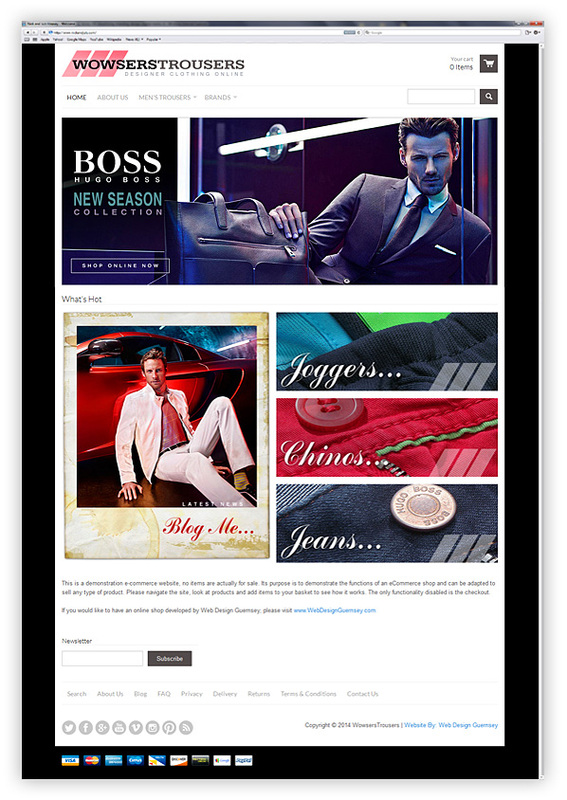 The home page utilises a rotating banner feature which highlights offers on specific brands. Underneath this is a link to popular sub-categories and also to the shop’s blog. A regularly updated blog is a great tool for e-commerce websites as it allows it’s pages to be found in Google and Bing and brings natural search traffic to the site. The site is split up into different page ‘types’ so customers are able to view products by category i.e. 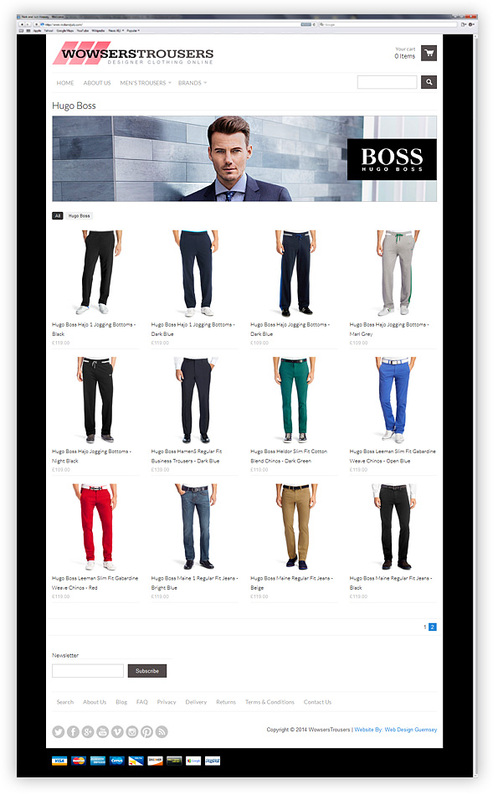 ‘men’s trousers’, by sub-category ‘jeans’ or ‘chinos’, or by brand such as ‘Hugo Boss’ or ‘Ralph Lauren’. The design also incorporates links to all of the stores social media channels and e-newsletter sign-up form. The over-all look of the site is classy which reflects the high-end, designer brands that the demonstration online shop sells. The back-end of the website or the content management system (CMS) allows the shop owner to easily manage orders, customers, products and page content. Adding products, categories & brands, updating or adding pages is simple to do and requires no technical knowledge. Postage rates and taxes are easily edited and updated. In addition to these simple tasks, more advanced online marketing techniques can be employed if necessary such as Abandoned Cart Recovery Remarketing. The CMS can be accessed by any device that has an internet connection and the system is password protected. The Wowsers Trousers logo was kept deliberately bold and simple to reflect the high class brands sold in the demonstrations e-commerce website. If you would like help or advice with setting up an e-commerce website, online shop or redeveloping an existing one, please get in touch, I’d be happy to discuss your requirements.